Last year I began a quest to get in shape and have fun birding by keeping a list of species I saw while biking or walking from my back door. I haven’t provided an update recently on my adventures in 2011—in fact I don’t think I’ve mentioned it since my biking birdathon back in May! Last year I tallied 192 species by non-motorized transport (NMT) and biked 1374 kilometres; my goals this year were to find 200 species and bike over 2000 kilometres. By the end of May I had 170 species, but then things got tough. I added a few species over the summer—a Flammulated Owl in a nest-box a few kilometres from home, a Black Swift rocketing over the house, a female Gray Partridge with a youngster walking across the lawn. Fall migration brought a few shorebird species, but Penticton has few mudflats so I’ve missed a number of species that would have been easy farther north in the Okanagan Valley. This kind of birding isn’t always easy. On September 19th I set off to Kaleden to look for a Red-breasted Sapsucker reported a couple of days previously. After pedalling for 20 kilometres and climbing a big hill, I was just pulling into the driveway to look for the sapsucker when my phone rang. It was Laure Neish, breathlessly reporting a Sabine’s Gull back in Penticton, only minutes away from my house. Agh! Needless to say, I looked in vain for the sapsucker for 40 minutes, managing only to call in a Northern Pygmy-Owl. Disappointed, I biked back to Penticton but couldn’t find any trace of the gull. Strike two. I got my first real rarity on October 3rd, the Ancient Murrelet covered in this month’s earlier blog. Three days later I was down on the Okanagan Lake beach again and saw Laure Neish, the murrelet’s discoverer. As we stood there chatting, she said, “Don’t you need scoters for your NMT list?” “Yes!” I said, turning around to see four Surf Scoters flying by the shore—species #188. On October 8thmy son Russell walked down the hill to bird in the thickets along the Okanagan River, hoping for a vagrant warbler or two. I soon got a call from him, announcing not one but two Bewick’s Wrens—the first record for the Penticton area. This species has been solidifying a toe-hold in the Okanagan over the last few years, but are still very hard to find north of Oliver. I jumped on the bike and was down there in a couple of minutes, but it took 15 minutes of nervous searching before we relocated the birds. Number 189! 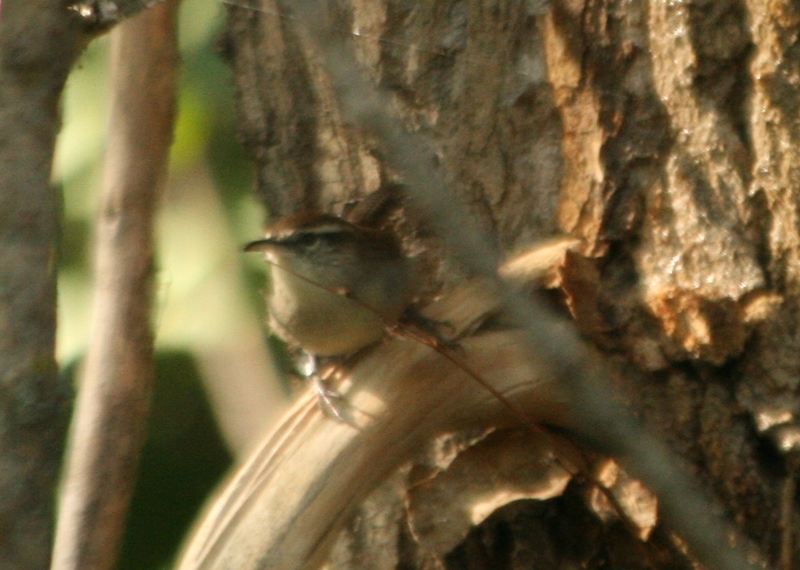 Bewick's Wren along Okanagan River in Penticton, BC, 8 October 2011. I just noticed as I heavily cropped this poor picture that the bird was banded! This is probably a bird dispersing from the Oliver area to the south. Russell called again a couple of days later with news of another Sabine’s Gull—this one flying lazily along the Skaha Lake beach. Although it was late in the day I jumped on the bike and was away—realizing as the wind blew through my beard as I sailed down the hill that I’d forgotten my helmet. I kept going down the river trail to Skaha, but there was no sign of the gull. Russell had said the bird was last seen heading south along the west side, so I got onto the old railway grade and headed towards Kaleden, but still couldn’t see any little gull with a striking wing pattern. On the way back I checked the oxbows for dowitchers and Pectoral Sandpipers, but no luck there either. It was getting dark by the time I got home. On October 10th, on one of my regular checks of the Okanagan Lake waterfront I managed to find a Pacific Loon with some migrant Commons, but couldn’t turn any of the Western Grebes into the rarer Clark’s—though Laure Neish had seen one there the week before. On October 18th I cycled down to Vaseux Lake on a picture-perfect fall day—the lakes like mirrors, reflecting the golden leaves of cottonwoods and aspens. After helping Doug Brown dismantle the Vaseux Lake Bird Observatory, I searched the shrubs nearby for Pacific Wren, a species Doug had seen regularly there in October. No luck. I then went down to the boardwalk (featured prominently in The Big Year movie, standing in for Patagonia Lakes State Park), where I managed to find a Pacific Wren hiding under the boardwalk itself. I’d been there a couple of days before on a field trip with Canadian Migration Monitoring Network participants, and we’d seen Chukar up against the cliffs. So I cycled up the gravel road to the cliffs, then walked along the edge of the giant talus slope. Canyon Wrens chattered in the warm afternoon sun, and finally I heard a Chukar, well, chuckling. I was up to 192 species, tied with 2010! The next day, Russell returned from a wild birding expedition to Haida Gwaii with friends Ilya Povalyaev and Ryan Merrill. As I stood on the porch to welcome them back, a Hairy Woodpecker flew overhead, calling. Number 193, and a huge relief to get a common species that had so far eluded me despite many trips into the forests around town. Then, on the afternoon of October 22 I got another call from Laure Neish—this time she’d found an adult Lesser Black-backed Gull along the beach—just where we had the scoters. I put on my shoes and was away—and this time the gull was there, and Laure had stayed there to point it out to me—a dark-backed gull with a big yellow bill floating with the California Gulls just offshore. There are a good number of possible species I can add to my 2011 list over the next two months—perhaps a Greater White-fronted Goose will appear on the golf course with the Canadas, or a Harlequin Duck might show up at Okanagan Falls. I haven’t seen a Northern Goshawk or Rough-legged Hawk yet, both reasonably common wintering birds around here. And maybe I’ll finally have to make that hike up the mountain to get Dusky Grouse, Gray Jay and Pine Grosbeak. All I need is a half-dozen species–and I’m only 181 kilometres shy of the 2000 mark! Thanks for the update! It sounds like you’re putting in a lot of effort and seeing some good birds for your area. I enjoyed reading your account.